In our mini-review of the Xbox One I speculated that the shipping version of Microsoft's console featured 14 AMD GCN CUs (Graphics Core Next Compute Units), with two disabled to improve yields. Microsoft publicly stated that Xbox One development kits featured 14 CUs and Sony similarly had 20 CUs with only 18 enabled with the PS4. 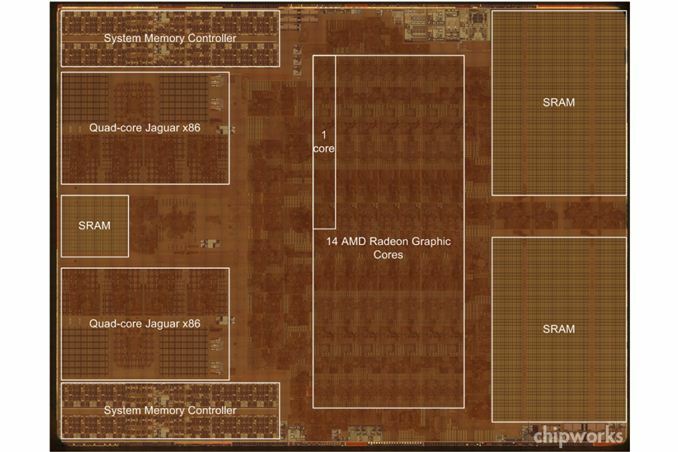 With Xbox One hardware in the wild, Chipworks went to task delayering the SoC/APU and confirmed the speculation - the Xbox One does indeed feature 14 CUs (pictured above). Microsoft claims it weighed the benefits of running 12 CUs (768 cores) at 853MHz vs. 14 CUs (896 cores) at 800MHz and decided on the former. Given that the Xbox One APU only features 16 ROPs and ROP performance scales with clock speed, Microsoft likely made the right decision. Thermal and yield limits likely kept Microsoft from doing both - enabling all CUs and running them at a higher frequency. Chances are that over time Microsoft will phase out the extra CUs, although it may take a while to get there. I'm not sure if we'll see either company move to 20nm, they may wait until 14/16nm in order to realize real area/cost savings which would mean at least another year of shipping 14/20 CU parts at 28nm. Compared to the PS4's APU, we see a very similar layout. The on-die SRAM sits next to the GPU array, and far away from the CPU, which makes sense given that the latter isn't allowed direct access to the eSRAM. You can very clearly see the tradeoff Microsoft had to make in order to accommodate its eSRAM. The GPU area shrinks considerably. Actually GPU core-counts are hugely exaggerated, and that ChipWorks' notation is at least as accurate as the way things are marketed in the consumer space. In almost every single field except for 3D graphics, a "core" is considered be an entity that executes one or more independent instruction streams ("or more" if it happens to implement SMT/hyperthreading). A core that processes multiple *data* streams via SIMD is still counted as one core. For example, Haswell can process up to 8 32-bit data elements per AVX instruction, but it's still counted as one core. GPUs are in fact SIMD machines, just like Haswell's AVX engine. Each "Radeon Graphics Core" in XBone or PS4 executes one instruction stream. The fact that each such instruction is applied to 64 data elements in parallel does not make it "64 cores" any more than AVX support makes a single Haswell "8 cores". There a [weak] counterargument here: GPU's have a trick that AVX doesn't (yet), namely the ability to *emulate* multiple instruction streams via vector predicates. What this means is that the entire vector engine executes the same instruction stream, but individual lanes can be selectively enabled/disabled. This allows divergent execution (different lanes appear to execute different code) though at a huge performance cost since every lane in a GPU core has to execute every instruction that any lane requires. Most people other than GPU manufacturers would say that's not sufficient to qualify the lanes as independent cores. My guess would be some logic for coherency. There are two CPU clusters, a GPU, audio DSP's and other IO that all have a need to be coherent with at least one other part of the system. Another idea would be memory for exclusive usage by the system's hypervisor and/or DRM.